The Romans had no symbol for zero. Their number system was NOT based on place value. If they wished to express the concept ‘nothing’ they would use the word “nullus”. The first evidence we have of the use of zero is in India. Indian mathematicians were using zero in a place value system c.CD to D CE (c. = circa = around) When the Roman Empire was already in decline. Zero spread with trade along the Silk Road to China & the Islamic world. 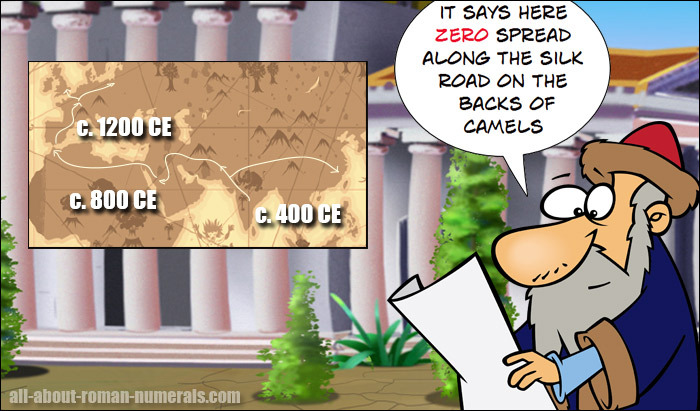 The Arabic mathematician Muhammad Al-Khwarizmi introduced zero to Islamic world in the DCCCs. He continued to develop the number system throughout his life. To this day our number system is referred to as the Hindu Arabic system in honour of its inventors. By the twelfth century Arabic texts were being converted to Latin by European scholars. Eventually an Italian mathematician named Fibonacci wrote a book called the Liber Abaci where he began to convince people that the new number system was superior to Roman numerals. The invention of the printing press in the 1450s (by the guy in the graphic – Johannes Gutenberg) meant the use of the Hindu Arabic number system became even more widespread. Over the coming centuries European powers conquered lands all over the world and they took the zero all over the world.